[131 Pages Report] The global heart pump device market was valued at USD 1.32 Billion in 2016 and is projected to reach USD 3.98 Billion by 2022, at a CAGR of 19.4% during the forecast period. Base year considered for the report is 2016 and the forecast period considered for this report is 2017–2022. Some of the major players in the global heart pump device market are St. Jude Medical (subsidiary of Abbott Laboratories) (US), Abiomed (US), Medtronic (Ireland), Getinge (Sweden), Teleflex (US), ReliantHeart (US), BerlinHeart (Germany), Terumo (Japan), SynCardia Systems (US), TandemLife (CardiacAssist) (US), Jarvik Heart (US), and Fresenius Medical Care (Germany). 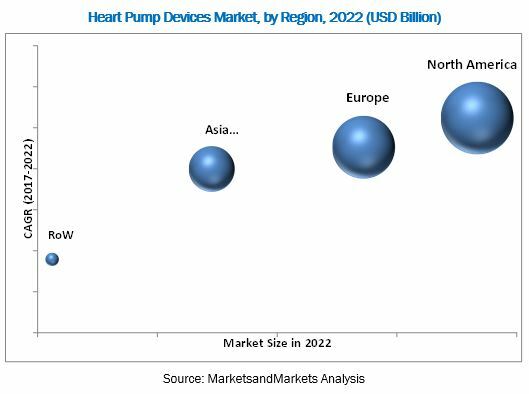 The global heart pump devices market is projected to reach USD 3.98 Billion by 2022 from an estimated USD 1.64 Billion in 2017, at a CAGR of 19.4% during the forecast period. 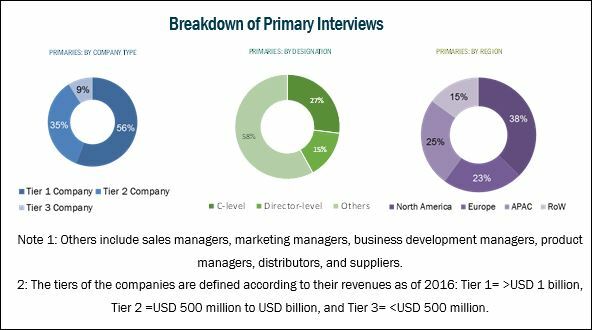 The growth of this market is majorly driven by factors such as growing prevalence of cardiovascular diseases, increasing number of regulatory approvals, and an acute shortage of donor hearts. The heart pump device market is segmented on the basis of product, type, therapy, and region. Based on product, the market is segmented into ventricular assist devices, intra-aortic balloon pumps, and total artificial heart. The ventricular assist devices market is expected to grow at the highest CAGR during the forecast period. High growth in the ventricular assist devices market can be primarily attributed to the increased dependency on ventricular assist devices for the treatment of heart failure and technological advancements to improve the safety of these devices. Based on type, the global heart pump devices market is segmented into implantable and extracorporeal heart pump devices. The implantable heart pumps segment is expected to grow at the highest CAGR during the forecast period. Technological advancements in implantable heart pump devices have made them more reliable and safe as well as improved their efficiency, thus allowing their long-term use as a survival option for patients who cannot undergo a heart transplant procedure (particularly in end-stage heart failure patients). Based on therapy, the global heart pump device market is categorized into bridge-to-transplant, bridge-to-candidacy, destination therapy and other therapies such as bridge-to-recovery and rescue therapy. The destination therapy segment is expected to register the highest CAGR during the forecast period. The adoption of DT is likely to increase in the coming years owing to technological advancements in heart pump technology to improve their safety and efficacy and the quality of life for patients. Geographic segments in this report include North America, Europe, Asia Pacific, and RoW. Of these, the North American segment is expected to account for the largest share of the market in 2017. The large share of this region can primarily be attributed to the rising prevalence of cardiovascular diseases, favorable reimbursement scenario, and the increasing number of regulatory approvals. The high cost of devices and implantation procedures and poor reimbursement scenario in developing countries is expected to restrain the growth of this market during the forecast period. For instance, in emerging countries such as China and India, no coverage is provided for heart pump devices, thus increasing the out-of-pocket expenditure by patients. The major players in this market include St. Jude Medical (subsidiary of Abbott Laboratories) (US), Abiomed (US), Medtronic (Ireland), Getinge (Sweden), Teleflex (US), ReliantHeart (US), BerlinHeart (Germany), Terumo (Japan), SynCardia Systems (US), TandemLife (CardiacAssist) (US), Jarvik Heart (US), and Fresenius Medical Care (Germany).